Over time, teeth which are not brushed regularly and cared for can become	stained or darkened by food, tea, coffee, and a wide variety of other	substances. At A1 Dental Care, we want you to be happy and confident with	your smile. If you want to improve the appearance of your smile and boost	your self-confidence, our Las Vegas dentists can help. From simple procedures,	such as in-office teeth whitening, to more complex services such as crowns	and implants, our staff has the expertise necessary to provide you with	top-tier dental care. Lumineers and veneers: Get permanent, teeth-whitening results with low-maintenance, custom-made	Veneers or Lumineers. Smile makeovers: Transform your smile with a Smile Makeover from A1 Dental in Las Vegas. Our leading Cosmetic Dentists take pride in providing our patients with	advanced dental restorations to create the perfect smile you desire. Teeth whitening: Remove teeth stains or discolorations with professional teeth whitening	at our Las Vegas dental office. Invisalign: Straighten your teeth with Invisalign’s advanced clear aligner system. 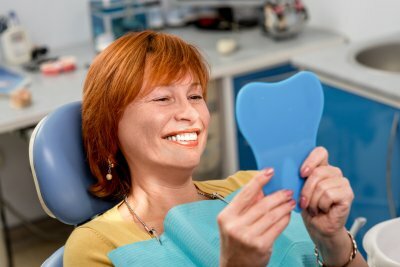 Dental implants: Dental Implants are an effective way to replace missing teeth and restore	your smile. CEREC same-day crowns: Enjoy the convenience of same day dental restorations with on-site CEREC	crown technology. If you have specific concerns about your smile, our staff can work with	you to create a custom treatment plan for you. In the event that you simply	want to get your teeth whitened, we offer same day appointments for your	convenience. Contact us now at (702) 450-6060 if you would like to make an appointment.